It was former Labor Health Minister John Hill who coined the exception to the old political adage that you should Never Comment On Opinion Polls. He then went on to extol the virtues of the government of which he was a senior member and why it had been so thoroughly endorsed by whichever survey was capturing headlines on this particular late-Noughties day. In the event, the polling numbers soon went south, but Labor managed to hang on to government for another two election victories. But the Hill Exception evidently still holds true (either that, or current Premier Steven Marshall, a latecomer to the politics game, never bothered to learn the original adage in the first place). For in the first Question Time of the week, it took Marshall a mere six sentences into his first answer (on the state’s employment figures) to turn his attention to the Sunday Mail’s weekend YouGov Galaxy poll which had his Liberal Government flying high on a 52 per cent two-party-preferred nominal vote. Responding to an interjection from Shadow Treasurer (and perennial leadership contender) Stephen Mullighan, the Premier swiftly seized his chance: “They are so excited in his office about the recent poll that was covered in the Sunday Mail,” he beamed. And indeed, the Galaxy poll has been broadly interpreted as good news for Marshall’s Liberals. “Marshall rides high”, the front page headline pronounced, not unfairly given the Premier could point (and did, indeed) to the fact that 46 per cent of the 844 respondents prefer him as Premier to Peter Malinauskas – albeit with 28 per cent uncommitted. But Opposition Leaders rarely make much headway on this sort of measure – as Marshall knows all too well. Indeed, just three years ago, he achieved the equal lowest showing in a Newspoll approval rating for an SA Opposition Leader (which is not, incidentally, the same thing as ‘preferred premier’) since 1990. His 30 per cent return was only matched by Mike Rann in 1999. Both men went on to become Premier within three years of the offending poll. This week’s numbers deserve close scrutiny, of course, because statewide polling is so rare in SA, and this one thus provides the most comprehensive snapshot of voting intentions since last year’s election. But it’s hardly depressing reading for Labor either. Indeed, the question for Marshall could well be – why isn’t he and his party further ahead? There were big question marks after the 2018 election about where the SA Best primary votes would end up once the disaffected voters who had wandered over to Nick Xenophon’s odd electoral experiment had ended their brief dalliance. The Galaxy poll shows the ALP’s primary vote increasing from 32.8 to 37 per cent, while the Libs have gone from 38 to 42 – which suggests SA Best voters either haven’t been overwhelmingly persuaded by one major party over another or have simply gone back whence they came. The two-party figures – 52 to 48 – have barely moved from the election roughly this time last year, which handed the Liberals a comfortable if not overwhelming majority. And yet, Labor won elections with similar numbers in 2002 and 2010, and with worse numbers in 2014. Indeed, it was only three years ago that bereft Liberals argued they’d need to routinely win 54 per cent of the statewide vote to hold any hope of ever forming government. Which reminds us of another steadfast rule of politics – or at least latter-day SA politics: that any given election is as or more likely to be decided by the whim of the next Electoral Boundaries Commission than anything the Government of the day does or promises to do. And the looming redistribution is a befuddling proposition, given Labor’s last-ditch pre-election move to abolish the contentious “fairness clause” in the Constitution Act – with no-one game to predict what the practical result of that reform will be. It could well mean that the ALP’s much-argued “one vote, one value” principle once again becomes the primary focus of the Commission – a principle that historically ensured conservative votes were parked en masse in safe rural and regional electorates while Labor’s vote was more concentrated in metropolitan marginals. If that happens, Labor will back itself to be able to pull off an election win on the weekend’s polling figures – it has, after all, done so several times before. In truth, though, there are probably too many variables to make much sense of it all. There was an obvious trigger for conducting the poll this week – to mark Marshall’s first year in office. But for now voters’ minds are, if bothered by politics at all, likely more fixated on the impending federal poll, at which the Liberal vote is expected to plummet. So has the federal Liberal brand been an added weight on Marshall’s polling numbers? Has the looming election sullied the numbers? He’d also be buoyed by another fact. Labor’s statewide vote has traditionally been low because the party has literally not bothered campaigning in those safe rural and regional Liberal seats. That confounds electoral analysis because the ALP has never campaigned to win the two-party vote – it has always campaigned to win a majority 24 (or more) of 47 seats. 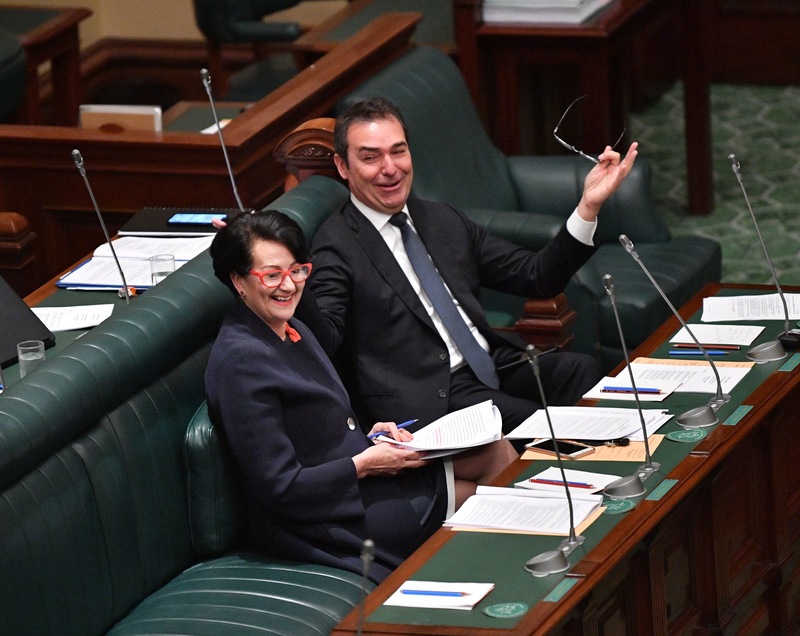 In the year since the state election, however, Malinauskas has made a point of visiting every electorate in the state – and a particular point of visiting the regions. Thus, this poll could be considered more indicative of genuine statewide sentiment – rather than a reflection of the fact Labor hasn’t tried to court voters in a significant chunk of seats. But there are warning signs for Marshall too. He ended 2018 on a high, spruiking his beloved SA Space hub, and has kicked off 2019 in much the same vein, grinning his way through City Deal signings and beaming about bolstered business confidence. Despite the odd accident prone minister and the unnecessary fallout of a poorly-sold budget savings drive, the Government should be in its nominal honeymoon period. An equivalent poll for Rann at roughly the same point in his first term – not so very long after that 1999 nadir as Opposition Leader – gave him the helpful moniker ‘Mr 90 per cent’ – the aggregate of the positive or neutral responses on his performance as Premier. That was, as John Hill might have called it, an opinion poll overwhelmingly in your favour. The numbers for Marshall, a natural salesman better suited to government than Opposition, are nowhere near as stratospheric. There’s plenty of intrigue in the Galaxy poll, but neither side would be despondent about where they currently stand. The crucial question is: in which direction are they moving? Which, in this case, it isn’t.